Just received an email asking for me to test out future software. Awesome been waiting to hear something. How long do you have to wait for the download after doing the initial survey? Yep got it too. Good deal. I have yet to get the download link or instructions lol. Can't wait! No idea, but my best guess would be within a week. Hopefully before the holiday. How can I get on said email list? Funny that ATT and Verizon are getting it before the unlocked and the Dev edition. Lol. I have it on my VZW Moto X, but not on my Nexus 7 2013. Who would of guessed that? But dont you have to unlock the bootloader and root for that? 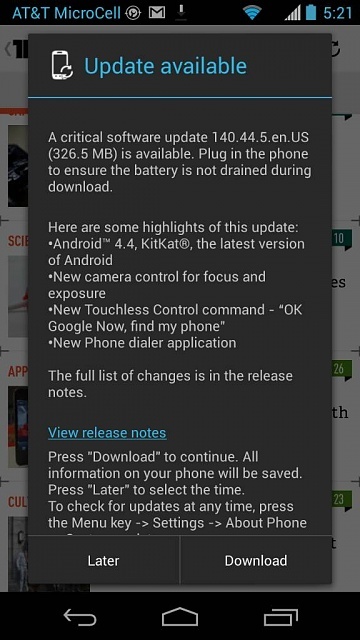 4.4 isn't that supported yet, and isn't different. so not really worth going through all that on my N713 and N10. No you dont need to do that to side load. You can sideload stock. Its the exact same thing as the OTA you are just forcing it to update And load the zip from your PC. Its super simple. Jerry made a post on it. Takes minutes. You can also download it directly to your phone and install it from there. Is there an alarm clock or calendar app that allows me to set alarms by date? High Android OS use after KitKat update?